Host a soup swap on the third Saturday of January to celebrate Soup Swap Day. A well-made stock is the base of good soup. Soup Swap Day is a day to spend quality time with family and friends and share some homemade soup with them to take home. Started by Knox Gardner and his friend in Seattle, Soup Swap Day became an unofficial holiday celebrated all over the United States in 2006. Today, the holiday is celebrated by soup enthusiasts in many other parts of the world. Soup is often given to people when they are sick or nursing a cold. Chicken soup is especially used for its soothing qualities. 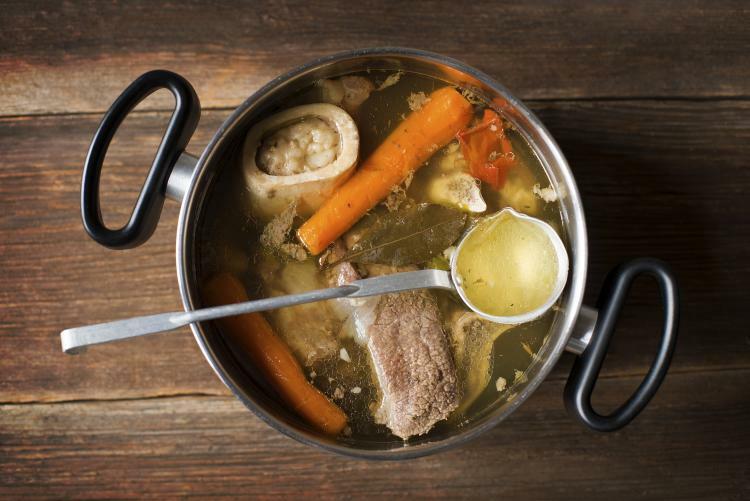 It makes sense, broth made from bones and vegetables are very nourishing and easily digested. Host a soup swap. Have friends and family bring homemade soup in containers. Make sure everyone brings the same number of soup filled containers as guests. Share soup with everyone – each guest should leave the same amount of soup as they come with. …that the earliest known record of humans eating soup dates back to 20,000 years ago? Need a reason to forget your New Year’s resolutions? Today is a good day to ditch them. Appreciate the nuances of language and learn some new words on this lexical holiday. Recognize the role the humble tin can plays in kitchens and pantries around the world. Treat yourself to a bowl or two of the crunchy, delicious, often-time addictive, but mostly healthy snack today.